I have lists that are on my push lists from my phone but they are not showing up on the website. Is there a limit per account on the number of lists? Maybe I am setting this up wrong. I thought I needed a list for each grocery store or website I purchase from. I still need to add at least 8 more. Any idea on when all of the information put into our Mighty Grocery, i.e. pantry, receiptes, etc. will able to be saved and edited on the website? Is there a way to back this information up incase something goes wrong with my phone, as the LG G2 doesn’t have an sd card. Thank you for your continued support and updates/improvements on this app. Selena, thanks for contacting us. 1) There’s no limit of lists per account. If you pushed lists and don’t see them online, most likely you are signing in a different account online. Please contact us at hi@mightypocket.com for further assistance. 2) Ability to edit everything online is work in progress, but unfortunately there’s no timeline. 3) Make sure that you check “Automatic backup on cloud” in your account settings. This will send all your grocery data to cloud every once in a while. If anything goes wrong, you will be able to sign in to your account and restore backup. can’t get in to my account it says there is no account help now ! 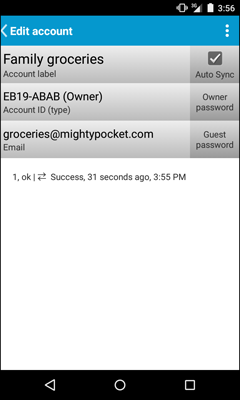 Mike, if you are using Free version of Mighty Grocery you will need to install Full version of Mighty Grocery on your old phone, transfer data, and Create backup. Then install Mighty Grocery on your new phone and Restore backup. Please let me know if you need any further assistance. Press Menu button of your phone. 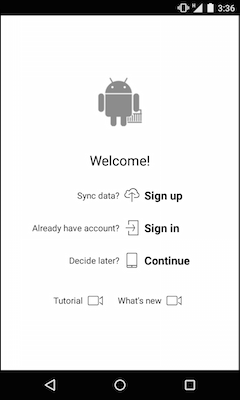 Tap Plus button on the top of the screen, select Login to account. Provide Account ID or Email of the account you want to get access to. Enter account’s Owner or Guest password. all i find is a + add account can get to your site help ? Mike, please make sure that you are using correct Account ID (or email) to sign in and you’ve set the password on your other phone under Menu > Settings > Accounts > (your account) > Owner password. Please contact us at hi@mightypocket.com if you need further assistance. Hi, I just downloaded the paid app to my Kindle Fire 1st edition. It is easier for me to use at home than my cell. I downloaded the free app to my Net10 smartphone and now I can’t link them together. Is there a computer download as well? I would love to sink them all together. Thanks for any help you can offer. Belinda, you need a full version in order to sync handsets. Try installing Amazon Appstore on your Net10 phone and download the Full version of Mighty Grocery. So I have to pay twice for it to work? I will try the amazon store. Thanks. Belinda, most likely you won’t need to pay again if you use the same Amazon account. I got it finally. Thanks. What about syncing the Recipes? Is it possible? Unfortunately, syncing recipes is not available in Mighty Grocery as of the moment, but we are working to make this possible in one of the upcoming updates. Will you allow syncing meals/recepies Please Please Please! Thanks for your feedback! Yes, we are working on syncing meals, recipes, pick list and History. Thanks for your patience! Yes, please add this sync feature, it is really needed in order to make the meals and recipes lists useful and complete. a lot of code is probably very similar to the one on the other lists. when will you release these updates? Dana, the update is on its way. Unfortunately, there is no specific date yet, but I hope the update will be available soon. 1. Can you explain the difference and relationship between Push and Sync? 2. I made a new list (Drugstore) on the tablet, added an item, and want to sync it with my phone. So I opened Cloud actions menu, tapped Push lists – and the Drugstore list is not there. All the other lists are there and checked. What do I do? Roy, 1) Push list is the first step in making your lists synced between devices. When you Pull lists from cloud on another handset, your lists on two handsets are synced and changes will instantly transfer. 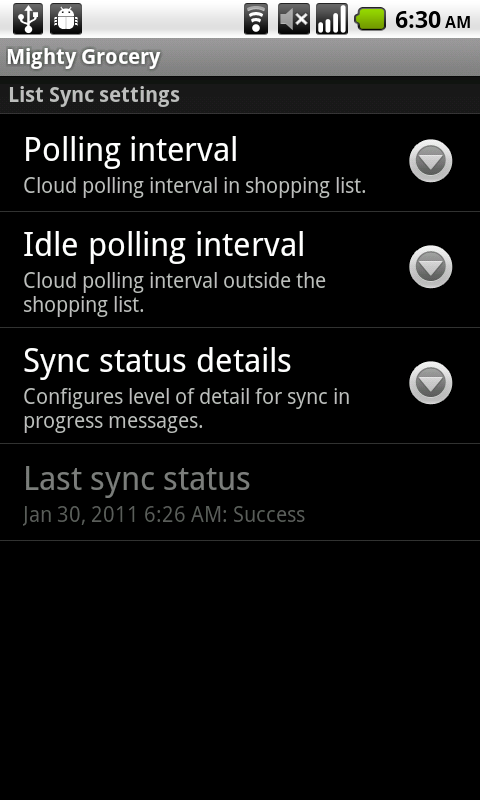 2) It should be possible to sync any shopping lists on your handsets. Try scrolling the list up, most likely Drugstore is in the bottom of the list below the screen line. If this does not help, please contact us at hi@mightypocket.com for further instructions. I have so many lists that differ and such a mess of things that I have uninstalled Mighty Grocery from my Android phone. In hopes to create ONE section, I have deleted all lists from my Android tablet, except for the main favorite list of “Groceries” (which is quite lengthy…I’ve been building this list over 2 yrs). When I go online and sign in to the website, I can’t see where any of the info that I’ve deleted (in order to start all over) has disappeared. I have never seen an advantage or help from going thru the website…all I see there is a mess of stuff to which I seem to be adding. I want to go back & add some individual favorites, i.e., Target, Lowe’s, etc. which were specific lists for those particular stores. I plan to do ALL adding to only my tablet. I uninstalled the app from my Android phone last night. Tonight I reinstalled it, but when I pulled the lists…half of the “Groceries” didn’t come over. I love this app and use it constantly, however it has gotten so messed up I’m ready to discontinue and move on to another app. Vickie, thanks for your patience with the issue and I am glad that we could get it resolved. For anyone reading this — contacting via email is the fastest and most reliable way to get support with Mighty Grocery. Yes the learning curve is complex and mistakes easily made. The only reason I have persisted is the sync feature. I am having difficulty copying my pick list to another device. Everything else comes across, aisles, lists etc but not the master pick list. I imagine I could do this by adding everything in the pick list to a list then syncing, but this seems unnecessarily time consuming. The same applies to the basic web UI. Advice would be much appreciated please. I was wrong about the web UI. Its only another device I can’t transfer the pick list to. Cath, thank you for your comment. We are working to make syncing Pick list easier going forward. Thank you for your patience. First I wanted to say I love this application and am so glad to see this back up feature, my phone was stolen, so backing up on an SD card was not helpful, while the website get most of what was on the lists, I lost a lot of information, history and all. I have been wanted to start using this app again but am hestitant. I not longer have an SD card, but see there is a cloud back up. Does this back-up everything, receipes, lists and every bit on information that I input? I see in comments that you are working on IOS verision, if I have a the Android version on my phone when this is available will I also be able to get it on my Ipod and sync between? I am assuming I will need to pay for the IOS verision. Thank you for your help, you are doing an awesome job!! Selena, thank you for your feedback and your questions. Have you tried restoring backup from Cloud? 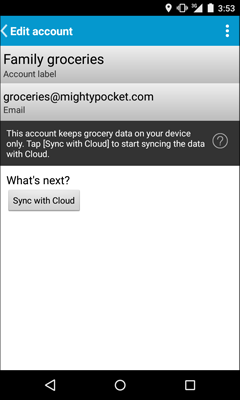 The app automatically creates backup of all your grocery data on cloud (including History and Recipes) unless you disabled this feature in Accounts settings. Please make sure that you have “Automatic backup on cloud” option enabled under Menu > Settings > Accounts > (your account). It will be possible to sync all your data with iOS devices once the app is available. It will require a separate payment for Premium features though. Hi. There seems to be a long learning curve but I continue. I can not get the sync part to work. So far we are only working with the groceries list. I have followed the tutorial step by step. 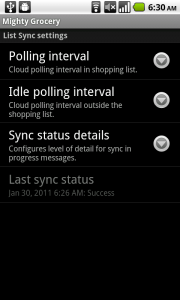 I’m told that the sync is done, but none of the changes have taken place. I am not sure where to go now. We are sitting down and copi Mbeki g are lists manually. Can you help?